The irresistibly insipid harmonies of the pop quartet BØBÖ have conquered the Seven Seas, and the band is touring every major city under the waves…except Bikini Bottom. To catch the band live, their most spazziest fan, a young fry cook named SpongeBob, must hit the road with his boating instructor, Mrs. Puff. But can Puff--and BØBÖ themselves--survive traffic jams, food allergies, and…SpongeBob's driving? Find out in "Take a Boat to BØBÖ!" Also, in part 3 of "Lost Booty," Deckhand Dottie and Fanboy Beard break into Pirate Prison for the next chapter of the lost SpongeBob comic! 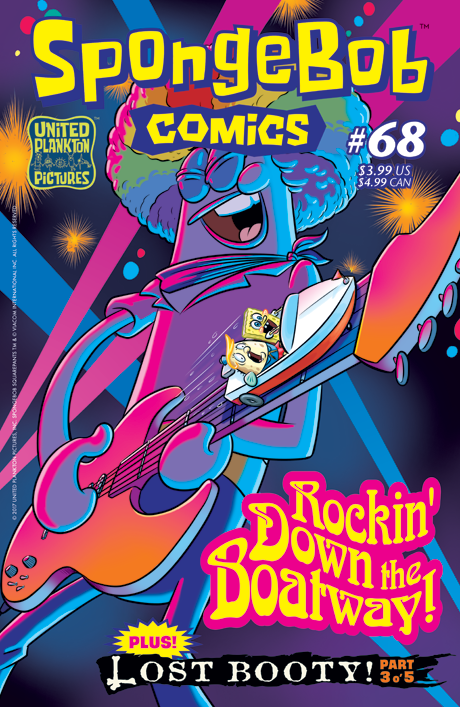 Plus “SpongeFunnies” by Kochalka and ocean facts from Maris Wicks!